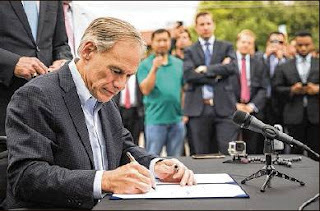 Governor Abbott signs HB 100 on May 29th, 2017, Memorial Day and brings back Uber and Lyft to Austin, TX. It has been exactly 3 years since Uber and Lyft originally started up in Austin, in the Spring of 2014. The city has had plenty of ups and downs, during the past 3 years. The first few months, Uber and Lyft operated without the city's official blessing. Mayor Leffingwell only indicated that the city should have Uber and Lyft, but city officials considered ride-sharing illegal without an operating authority and a chaffer's license, but Uber and Lyft operated until the city passed an ordinance making TNCs like Uber and Lyft officially legal within the city limits. After one year of operating, the new city council was elected and decided to update the ordinance with additional regulations. The new council only had one hold over from the old council, Kathie Tovo and she voted against the original TNC ordinance. The new city TNC ordinance mandated a finger print back ground checks in 2015. The fingerprint check, was to be phased in over a 2 year period. Uber and Lyft proceeded with a petition to ask the people to vote on the new ordinance. In May of 2016, Prop 1, did not pass, Uber and Lyft stopped operating within the city limits. Ten other TNCs entered the Austin market: WingZ, GetMe, Fare, Fasten, RideAustin, InstaRyde, ScoopMe, Ztrip, Tride and Arcade City. The big guns, Uber and Lyft, focused their efforts on the 2017 State Legislative session. In 2015, we did have a ride-share bill that past out of committee, but that bill never made it for a House vote. In 2017, the legislators saw what Austin did and made the Ride-Share bill a priority. The 2017 session had a total of 4 ride-share bills filed. Three in the Senate (SB113, 176 361) and one in the House (HB 100). House Bill 100 passed by 75% and passed in the Senate by 68% after Senator VanTaylor changed his vote in favor the the bill. You can view the final Senate vote here. The Governor signed it 12 days later and since we had 2/3 approval, it goes into effect immediately. I went to the signing ceremony where I meet the Author Rep. Chris Paddie, Senate Sponsor Charles Schwertner and the Governor. A couple hours later, I also picked up my first Lyft ride! Amber Downing at KVUE asked for an interview on the current state of ride-share in Austin, TX. The State is in the middle of approving HB 100, that would make State wide regulations for Transportation Network Companies in Texas. The House has already approved the bill with 75% approval. We had the Indivisible group on the Trailer Park show on May Day! This political group sprung up after Trump's election. They aim to resist against anything Trump. The group is from central Texas. They are best known for setting up a number of fake meetings with local Federal congressmen that do not show up.